Form: A clumping, succulent-like herb. Mature Size: 1-2' high and 2-3' wide. Flowers: Yellow to yellow-green, aging to orange, in terminal clusters. Bloom: Late winter and spring. Fruit: A seed pod which can fling seeds far from the plant. Leaves: Blue-green, pointed, narrow to oval. Wildlife: The flowers attract bees. Avoided by mammals. Toxic / Danger: All parts are poisonous, especially the sap. Beware of skin and severe eye irritation when in contact with the sap. Origin: Mediterranean region and eastward. Sun: Full sun for the most compact growth. This plant becomes leggy in part shade. Water after becoming established: Every two months during drought, never in winter. Soil: Well drained, dry, low in organic content, pH 6.1-8.5 (slightly acidic to alkaline). Prune: Remove stems after flowering, to avoid seed scatter, and allow new ones to grow. Wear gloves to avoid the sap. Cut back severely in early fall to rejuvenate. Propagation: Seed and herbaceous stem cuttings. Allow the cut end to callous over before planting. This plant self-seeds easily. Uses: Xeric garden, unique specimen. 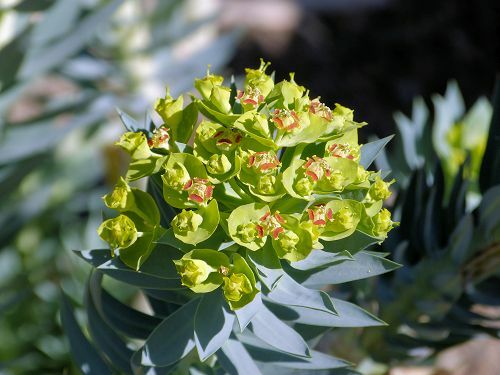 This plant is a member of the Spurge family (Euphorbiaceae). 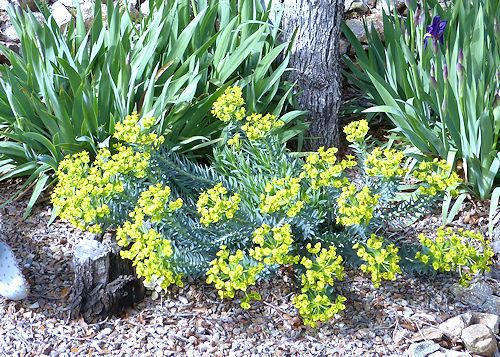 Another common name is Silver Spurge. It is care-free except that it reseeds freely. It thrives on neglect.